Apparently nobody "trends" like us .. whatever that means. I think it has to do with web searches. IE: how much something comes up in search terms. So, basically, people are searching for Peppermint more than the others. Anyway, I think that's what it is. It's a good thing then .. phew!!! Yeah, it means people are interested in Peppermint. 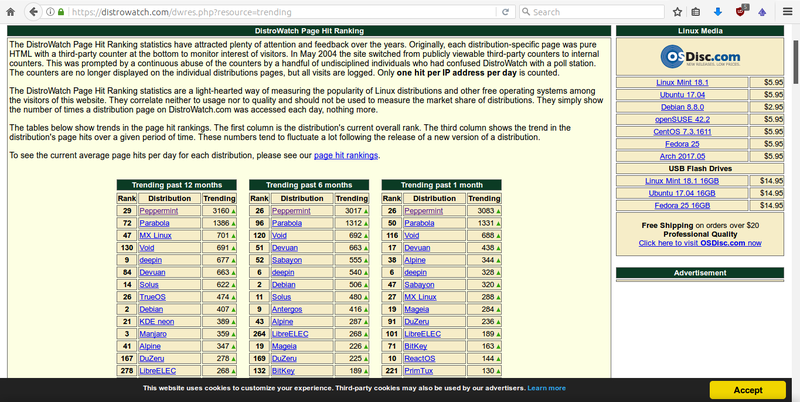 Interestingly, a lot of the ones on that list aren't the "top" distros DW, in terms of page hits. That means that, while people may be clicking on the pages for distros like Ubuntu, Mint, Debian, Fedora, etc., it seems that people are actually talking more about smaller projects like Peppermint. It's probably due to that more personal touch that you get with smaller distros. That's one thing I love about this distro. You're on here constantly making sure fires are put out, and your releases aren't "release it now, fix it later" releases, like you see in a lot of the bigger distros. You listen to user input and really try to come up with something that multiple people will enjoy. I'm sure that's attractive to a lot of people, especially people coming from Windows and OSX, where changes are implemented no matter who objects, and there's really no interaction with the end user by the people in the corporation. Even larger distros like Ubuntu and Fedora may come a bit too close to that level for a lot of people. So, that's probably why a lot of people are searching out and talking about distros like Peppermint and a lot of the other top trending distros. That's a good call, no not about me in particular but about smaller distros in general .. it's kinda weird (though understandable) that people new to the Linux world tend to think "well I'd better go for one of the bigger distros .. numbers can't be wrong", when in reality they'd be much better off going with a smaller distro where the team have more time (and inclination) assist. Yeah, I didn't necessarily just mean you. A number of the distros on the trending list are of the smaller variety. That says a lot. Probably the reason that distros like Ubuntu, Debian, OpenSUSE, Fedora, etc. are on the "click" list is because they're on the list. I mean, people go to DW not knowing much about Linux, see what's "most popular" and click on it. Though, Peppermint is a pretty solid performer on that list too. I'd just never looked at "trending" before because I had no idea what it meant .. so when I did I was surprised to see us at the top. Slow and steady wins the race. I've always seen the attraction to Peppermint, so it's great seeing that others are seeing it as well and it's thriving.